Sarri takes aim at his players after defeat in the Premier League. Maurizio Sarri believes that his Chelsea side have a mentality issue. The Blues' boss pointed the finger at his players after their 2-0 defeat to Everton at Goodison Park. 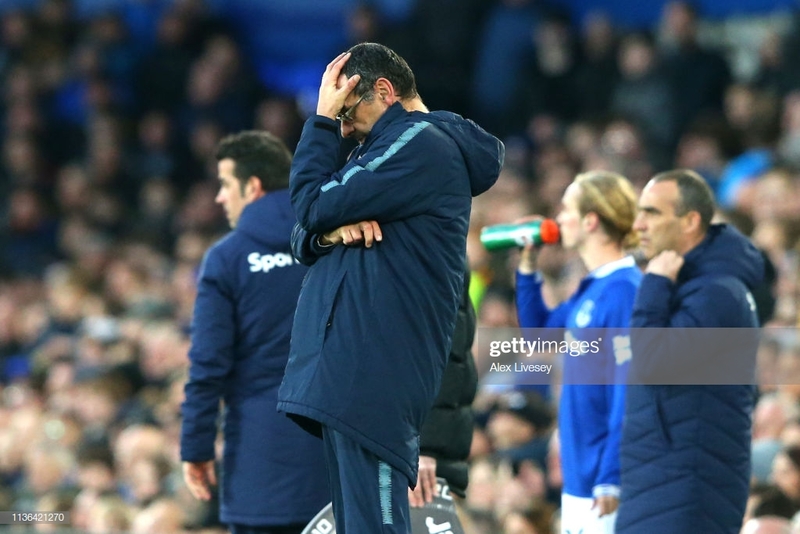 Sarri's team were in full control of the first half, however, after missing a series of good chances, they came out off the pace in the second period and conceded two goals from Richarlison and Gylfi Sigurdsson. “The problem was mentally, if you have that problem then the system and tactics is not enough,” Sarri told Sky Sports. “It was not at all [that we lacked motivation], we started the match very well with big intensity and strong mentality. “We played probably the best first-half of the season, we could have scored four or five times, we only had to continue this. "But, suddenly at the beginning of the second half we stopped playing, we didn't defend so we were in trouble, it’s very strange. “I cannot understand and the players don’t know either." Top four challenge, or no challenge? With a win, Chelsea had the opportunity to move level on points with fourth-placed Arsenal. The Blues, however, failed to capitalise on their game in hand which would have seen them move closer to a Champions League qualification place, leaving them in sixth place behind Manchester United. On their top four hopes, Sarri furthered: "We played the best 45 minutes of the season without conceding a shot, if we play the second half then we are in trouble. "If we play eight matches like the first-half then we can do everything, but I am worried about the mentality. Gonzalo Higuain was brought off after 65 minutes and the Chelsea boss believes his January signing is struggling with the demands of the Premier League. The Argentinian forward also missed the Blues’ trip to Kiev on Thursday due to illness. When asked if Higuain was finding things difficult, Sarri said: “In this moment, yes of course. “Today he had an opportunity. He can do more. He had problems at the beginning of the week so today it was normal he could only play for 65 minutes. “He has to improve physically and mentally."